Chronic wounds are a common complication affecting people living with diabetes. Attiva Plus is a sterile gauze, suitable for all types of skin. Its patented formula contains plant extracts which help reducing the pain sensation. 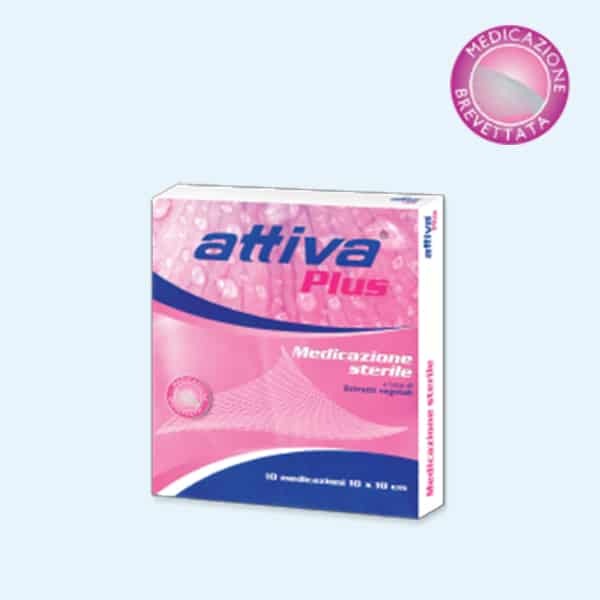 It has been clinically proven that Attiva Plus allows an acceleration of the natural healing process. Apply once or twice a day, after cleansing of the affected area, until complete recovery. Choice of wound care in diabetic foot ulcer: A practical approach. – Kavitha KV, Tiwari S, Purandare VB, Khedkar S, Bhosale SS, Unnikrishnan AG., World J Diabetes. 2014 Aug 15;5(4):546-56. Medicinal plants and their natural components as future drugs for the treatment of burn wounds: an integrative review. – Bahramsoltani R1, Farzaei MH, Rahimi R. Arch Dermatol Res. 2014 Sep;306(7):601-17. The effect of Centella asiatica, vitamins, glycolic acid and their mixtures preparations in stimulating collagen and fibronectin synthesis in cultured human skin fibroblast. – Hashim P. Pak J Pharm Sci. 2014 Mar;27(2):233-7. The efficacy and side effects of oral Centella asiatica extract for wound healing promotion in diabetic wound patients. – Paocharoen V. J Med Assoc Thai. 2010 Dec;93 Suppl 7:S166-70. Identification of Major Active Ingredients Responsible for Burn Wound Healing of Centella asiatica Herbs. – Wu F1, Bian D, Xia Y, Gong Z, Tan Q, Chen J, Dai Y., Evid Based Complement Alternat Med. 2012;2012:84809.